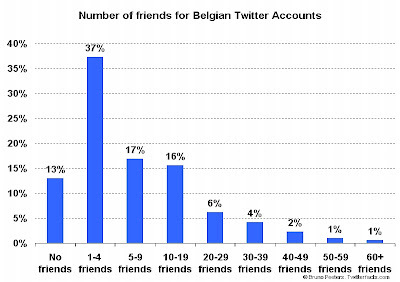 The community of Belgians in the Twitter universe counts at least 308 accounts. I was able to identify these 308 Twitter accounts using a combined approach consisting of looking at markers appearing on TwitterMap, performing searches using TwitterSearch or Twitterment or even good old Google. Another useful source is following the friends of already identified Twitters from Belgium. For the Belgian Twitter accounts open to everyone, I checked the date of the first update. 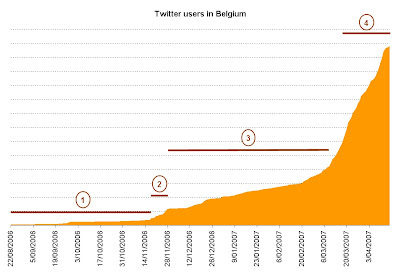 This allowed me to create a graph, showing 4 distinct phases in the growth of the Belgian Twitosphere. First phase : very early adopters - from August 22, 2006 until October 29, 2006 - 6 accounts. Second phase : first accelaration - from November 11, 2006 until November 29, 2006 - 18 accounts. Third phase : stable growth - from December 10, 2006 until March 9, 2007. Fourth phase : accelarated growth - from March 10, 2007 until now. I already published a first version of this graph on my blog in Dutch (bvlg.be) almost a month ago. The accelarated growth from March 2007 seems to continue. There is not yet a tipping point in sight. 70 Belgians or 22% have chosen the keep their updates only available to their friends. Most of them have probably read the blogpost of Peter Forret regarding the indexing of Twitter pages. 9 accounts or 3% are not available anymore. The owners of these accounts have chosen for whatever reason to stop twittering and to delete their accounts. 13% of the accounts have no Twitter friends at all. On the other hand Veerle Pieters has currently 98 friends. An average Twitter account from Belgium has 9,6 friends (which leads me to the next question - where can you find a 0,6 friend ?). A follower is someone who has indicated another Twitter account as friends and therefore receives all updates. 12% of the accounts have no Twitter followers at all, meaning that no one else on Twitter has indicated this account as a friend. Veerle Pieters has the highest number of followers (535). 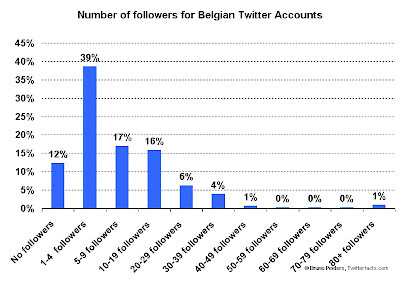 An average Twitter account from Belgium had 10,5 followers. The Twitter account from Belgium with most updates is Andrea Guerra - who is twittering in Spanish. At the moment of this writing, this account has 778 updates. 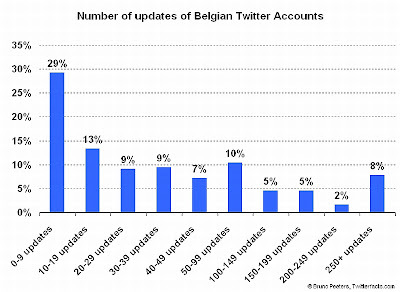 4% of the Belgian accounts (deleted accounts not included) are still waiting for their first update to be published. Currently an average average Twitter account from Belgium has 72 updates. 12% of all Twitter accounts from Belgium with a public feed did not post an update in the last 20 days. These account can perhaps be considered as "almost dead" accounts. 74% of all Twitter accounts from Belgium with a public feed did post at least one message in the last 7 days, indicating that these accounts are still alive and kicking. I first noticed Twitter being used at LeWeb3 in December last year. I think it had just recently been promoted at some conference the month before, which seems to coincide with Phase 2. Phase 4 seems to have taken off around the SXSW conference in the U.S. where it got enormous exposure again. Did you have any data about twitter in another country? Thanks. Do you have data just for Indonesian country?